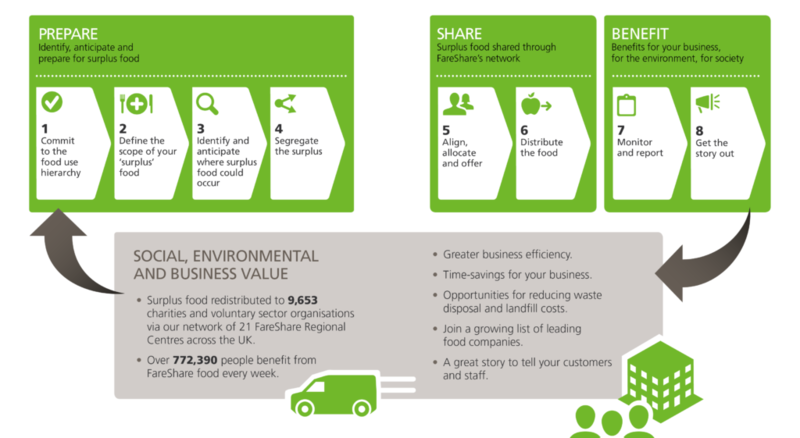 The FareShare Food Efficiency Framework is a unique framework that will enable your business to increase resource efficiency, reduce food waste and take proactive steps to support those experiencing food poverty. Using this framework will enable you to prepare and plan in advance for any potential food surplus that may occur within your operation. Food businesses are fast moving operations; our approach is to ensure this framework can be implemented seamlessly into your business and become part of your standard operational procedure. A small amount of time upfront will ensure you have the systems in place to maximise the social value of keeping food in the human food chain that may otherwise be thrown away. Following this framework is good for your business. All companies, at some point, have food that cannot be sold. Taking proactive steps to plan for and anticipate this surplus is the first step towards greater efficiency and waste reduction. Contact the FareShare Food Team on [email protected] for more information or to discuss next steps. If you’re a company with surplus food contact the FareShare Food Team to find out more.